Here is a long shot in the dark... Anyone know a good course around the Tokyo Japan area worth playing? Can't take my full bag but I will squeeze a few pieces of plastic in my luggage. you're gonna have to find lightweight stuff. Anything over 160g is considered a throwing weapon. You are unable to play a course with heavy discs. Damn, Brandon, didn't know that. Was in Arkansas last week and saw a A+ rated course about 8 miles from where I was staying. Heading back down in a month and thought I'd bring a small bag. 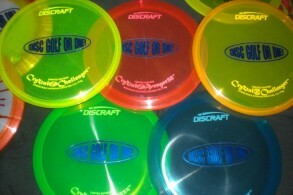 Anyone else know if that's a problem taking 160g+ discs on a plane?? Anybody playing in the a.m.? Thinking more of a casual round. Just not sure where yet. Avoid the ones with burning crosses. Dude at firefighters let his dog **** right in the middle of the fairway on hole 6 near the bucket and didnt pick it up. What is wrong with some people? What a crappy thing to do! Im thinking maybe firefighters tomorrow (saturday) around noon, probably throwing 2 or 3 rounds. Anybody care to join? Anybody down for a possible tag challenge? Not sure if you got a sheet. The majority has been talking in the lot and feels it should payout 3 spots with points for 5. 50/30/20? Yes i have heard. Im against only 3 spots paying out because i would like the newer players to at least have chance of winning some cash. Going down to 3 spots on payouts usually equates to only 5 bucks more for a win. Its easy for good players to be a little greedy and want more money. Besides the main focus should be on aces and dots anyway. Score is the secondary objective. Its not that much difference paying out that one extra spot. And changing the point awarding halfway through the season isnt a good idea either. I say the better players should stop worrying about 5 dollars and let the people that are newer to league play have a small chance to win a couple bucks. Does anybody have any input on this topic? I mean its not a terrible idea i just feel its losing sight of the real focus of the league. Aces and dots above all. Score is just a way to win a few extra bucks and a few extra points. We have already had a decrease in the number of beginner players as opposed to last year. I would like to hear some more input however. Tournaments pay out the top 1/3. BOBIS pays out the top 1/3. To keep the payouts to the top 3 spots does nothing to grow the league. It is a slippery slope where the people who win the most feel they will get slighted and get paid less. I say it is the opposite. They may not win every week but they will win more when they cash because more people will show up when the payouts are deeper. I see your normal 1st place payouts hover between $20 and $30. With more people attending, those payouts would be more. Handicapping averages worked well on monday nights, pro/am thoughts. either and or..
That's good too Jay. Also, if this is truly an Ace Race league then why not make the pay-in-to-play $10 per person per week. Make the pay out be $5 and the Ace Pool be $5? Then you can reward those who wish to win by score the top 3 spots. People playing in an Ace league should not be rewarded because they got a better partner in random draw, they should be focused on hitting Aces. Traveling to ohio next week for work. Any recomendations on courses that are a must play in the area of marysville, OH? Hambrick isn't too far away. Derek, the AM worlds were in that area a couple of years ago, there are several decent courses. I would say Deleware is decent, I also liked Pickerington. Due to the possibility of strong storms this evening, leagues MIGHT be cancelled for tonight. I will continue to watch the radar throughout the day and post the final decision around 5:00 pm. In the meantime im looking for a BEAT IN esp buzzz if anybody has them. ****ty.... it was 2 dudes and a girl, tyedye shirt on the girl? taller blonde dude and some randy in a hat and hoodie? Not the moose jaw buzz!?!? Whos playing when and where? Apologies to all for removing all my plastic from the trading post. It was my first time posting and honestly wasnt prepared for the overload of messages and responses. I work a lot of hours during the week, and run a league and quickly realized i would not have time to even reply to all of the messages in my inbox, let alone negotiate/ haggle/ ship/ etc. Umm Yea, I'd say so! Why are you playing open women at Stone Cold? We have dudes asking about stroke play and...you should get outta there! Ballinger and I are lookin about 2:15 teeoff. Displaying 1-20 of 73 total board posts.